A couple takes to the floor in Harmon, W.Va., in 2012. 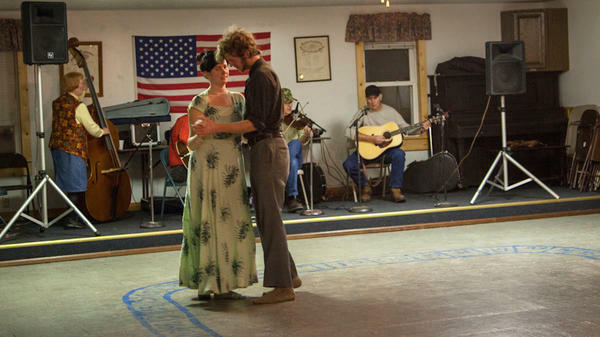 West Virginia is trying to revitalize its square-dance tradition. In West Virginia, cowboy boots are not required on the square-dancing floor. "No one wears the frilly costumes," she says. Or string ties and ten-gallon hats. Cowboy boots are optional, though a leather-soled shoe does make a particularly satisfying sound when it hits the dance floor. In fact, there's no dress code whatsoever, because it's all about the dance. "Everybody's on beat. ... That rhythm is just going, usually the fiddle is just like tearing into some old-time tune," Hill says. Hill says the music has to be live. There are even bands that ride the circuit, playing dances in small towns from Ohio to Virginia. Marlinton's downtown is about three blocks long. On Saturday night, the town seems deserted, until you walk into the Pocahontas County Opera House. The place is packed, and the din of conversation competes with the hot fiddles going on the stage. The floor trembles from the boots hitting the dance floor as couples dance two-by-two and four-by-four. 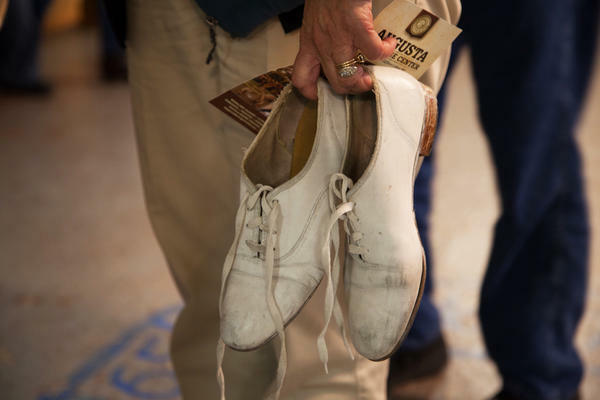 The square dance is part of a project headed by Gerry Milnes, a folklorist at the Augusta Heritage Center at Davis and Elkins College. "I saw them sort of slipping away — might be the fiddler passed away, and so the community dance tradition started to dissipate," he says. "At the same time, there were a few places that were continuing the tradition. And it seemed like something that we could get a hold of before it completely passed away." So Milnes enlisted Hill, and together they launched The Mountain Dance Trail to help organize and promote community dances around the state. "Most of these communities are rural, underserved communities throughout the state. Most of them don't really have an art center or a cultural heritage place, and so these dances kind of serve that purpose," Hill says. The Dance Trail is in its second year, expanding to 14 communities. But there's one key group it's having a hard time attracting. "We need the families; we need the parents to bring their kids and have their kids grow up at square dances," Hill says. An average crowd is made up of two groups: 20-somethings who come for a night out, and the over-50 set, like James Carpenter. He's a caller; it's his job to tell the dancers what they're supposed to do. "My goal is to get some young person to take over where I'm at, you know, and start calling these figures," Carpenter says, "because it's going to be a lost art one of these days." He points to the regular callers, all close to 70 years old. The callers yell out figures at a rapid-fire pace, switching from tight, four-couple squares to loose circle dances. Still, to many folks, square dancing is a relic of the past. Milnes disagrees. "Tradition acts in the present. It's based on the past, but it acts the present," he says. "It can only happen in the present." By the number of young faces in the crowd, it seems like these dances may have a shot, not just in the present, but in the future, too. Something old is making a comeback in West Virginia: square dancing. As reporter Jessie Wright-Mendoza explains, it's the result of an effort to rebuild what was once a pillar of small-town life. JESSIE WRIGHT-MENDOZA, BYLINE: First things first, Becky Hill says when you go to a square dance, please leave stereotypes at the door. BECKY HILL: Nobody wears the frilly costumes. WRIGHT-MENDOZA: Or string ties and 10-gallon hats. And cowboy boots are optional, though the boots do make a particularly satisfying sound when they hit the dance floor. In fact, there is no dress code because it's all about the dance. HILL: Everybody is on beat. It's just like that rhythm is just going, and usually, the fiddle is just like tearing into some kind of old time tune. WRIGHT-MENDOZA: The music has to be live, says Hill. There are even bands that ride the circuit, playing dances in small towns from Ohio to Virginia. Here in Marlinton, West Virginia, downtown is about three blocks long. On a recent Saturday night, the town seems deserted, until you walk into the Pocahontas County Opera House. WRIGHT-MENDOZA: The place is packed. The din of conversation competes with the hot fiddles going on stage. The floor trembles from boots hitting the dance floor as couples dance two-by-two and four-by-four. This dance is part of a project headed by Gerry Milnes, a folklorist at Davis and Elkins College. GERRY MILNES: I saw them sort of slipping away, might be the fiddler passed away, and so the community dance traditions started to dissipate. At the same time, there were a few places that were continuing the tradition, and it seemed like something that we could get a hold of before it completely passed away. WRIGHT-MENDOZA: So Gerry enlisted Becky Hill, and together they launched the Mountain Dance Trail to help organize and promote community dances. HILL: Most of these communities are rural, underserved communities throughout the state. Most of them don't really have an art center or a cultural heritage place, and so these dances kind of serve that purpose. WRIGHT-MENDOZA: The Dance Trail is in its second year, expanding to 14 communities, but there's one key group they're having a hard time with. HILL: That middle is what we need. We need the families. We need the parents to bring their kids and have their kids grow up at square dances. CARPENTER: (Unintelligible) heads up, the ladies bow. WRIGHT-MENDOZA: She's right. On this night, the crowd is made up of two groups: 20-somethings here for a night out and then the over 50 set, like James Carpenter. He's a caller. It's his job to tell the dancers what they're supposed to do. It sounds something like this. CARPENTER: (Unintelligible) goes on in the middle of the road (unintelligible). My goal is to get some young person to take over where I'm at, you know, and start calling these figures because it's going to be a lost art one of these days. If you notice the people out there calling tonight, we're all probably close to 70, you know? WRIGHT-MENDOZA: The callers yell out figures at a rapid fire pace, switching from tight four couple squares to loose circle dances. Still, to many folks, square dancing is a relic of the past. Gerry Milnes says that's not true. MILNES: Tradition acts in the present. It's based on the past, but it acts in the present. It can only happen in the present. WRIGHT-MENDOZA: And by the number of young faces in the crowd here in Marlinton, West Virginia, it looks like these dances may have a shot, not just in the present, but in the future too. For NPR News, I'm Jessie Wright-Mendoza. BLOCK: You are listening to ALL THINGS CONSIDERED. Transcript provided by NPR, Copyright NPR.